Beneath the existential troubles of “adulting”—marriage, bills, mortgage, bills, pregnancy, bills—exists something darker. 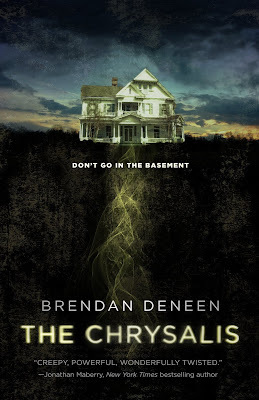 In the tradition of Lynch’s Blue Velvet and Cronenberg’s Shivers, The Chrysalis (Tor hardcover, on sale Sept 4) exposes the underbelly of suburbia…and what really lurks in the basement of a three-bedroom Victorian on a cul-de-sac. Forced out of New York City by rising rents and gentrification, barely-employed millennials Tom and Jenny Decker—an artist and a personal trainer—luck into an amazingly affordable, completely furnished house in the New Jersey suburbs. Jenny doesn't know there’s something hidden in the basement. Tom does. It soon has him in thrall. The Deckers' lives are suddenly on an upswing: Tom gets a big-bucks corporate job; Jenny, newly pregnant, opens a small gym catering to moms-to-be. Despite their worries about becoming boring suburbanites, they make friends and begin to acclimate to their new life. Tom regularly visits the basement, where his secret scrambles his senses and heightens his emotions, leaving him feeling euphoric and invincible. As his obsession with the thing in the basement grows, Jenny realizes that to save her family, she must expose everything. Before it destroys them all. For fans of 10 Cloverfield Lane, The Chrysalis is a recognizable horror story, retold for a new generation: a classic monster-in-the-basement story as well as an exploration of the dread and fright that comes with parenthood, marriage, and “growing up.” Because no one ever really wants to grow up…but sometimes acting like an adult is the only way to survive.